We continue to refine our knowledge of base elements that form compound words connected to <phobe+ia>. Listen to one student below explain his discoveries about kinemortophobia. 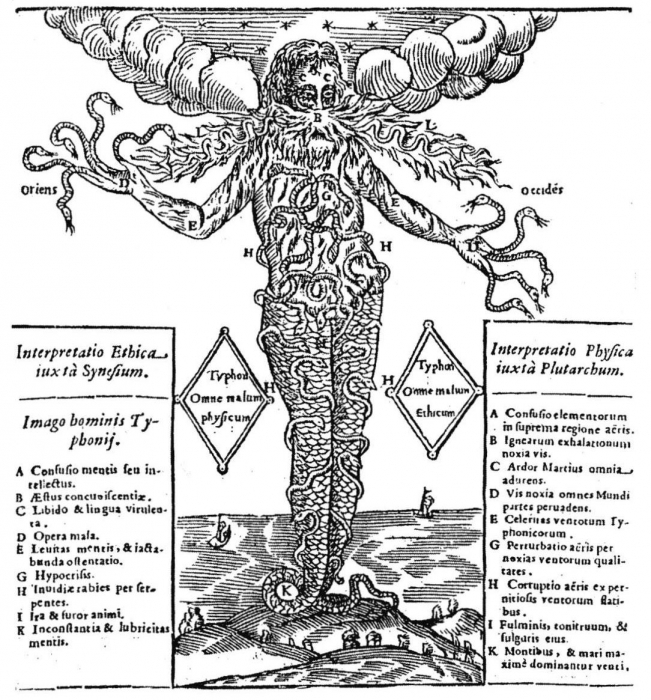 Through his work we also discovered more about hybrid words and hybrid creatures in mythology. the term compound. He needs to become more familiar with the term, but recognizes compounds are composed of more than one base element, in the case of <kinemortophobia> there are three and these bases are be bound. that the Online Etymology Dictionary will provide him with the roots of bases of compounds even when the entire word is not given. the morphemic structure of a word. His hands indicating stop show the boundaries of each morpheme and help to consolidate this awareness of morphemic boundaries and changes that can happen there. that the connecting vowel letter <o> is a separate morpheme. that the infinitive suffix is removed from a root to form a base element in English- he noticed this in the Greek root κινεῖν kinein to move, set in motion. that that by typing in the root in Online Etymology Dictionary more words sharing that root will appear: kinein. how to use the Online Etymology Dictionary by entering part of the word . He was able to discuss his process and make sense of the entry. to apply his knowledge of other languages to help him. that a final non-syllabic <e> is removed but not certain why- just a procedure. His removal of the <e>in <phobe+ia> indicates he needs understanding of this process rather than “that’s just what you do!” He reverted swiftly to dragging in ‘sound’ as a hypothesis for the removal- then realized that did not make a lot of sense!! that bases and elements need to be spelled aloud- he self corrected to do this. one of the functions of synonyms- can be to be express an idea more directly, informally or be blunter than a formal more polite, perhaps technical version- mongrel versus hybrid. He appeared to understand the connotations of implicit in ‘mongrel’. Hybrid, as a linguistic term refers to words with elements of different etymological origins. Hybrid entered English in 1600s via Latin although maybe Greek in origins and linked to hubris. Initially it referred to the young of a domesticated sow and wild boar, thus mixed parentage, or ‘mongrel’. As such its usage was rare until the 1850s. It’s link to hubris was surprising with its initial meaning of presumption towards the gods later expanding to include violence and insolence. Perhaps the implication is that mixed parentage results in impurity and as such is a violence to the gods. We have spotted many hybrids scattered throughout the Greek myths and these hybrids are truly monstrous. According to Theoi Greek Mythology, Echidna ‘represented or presided over the corruptions of the earth : rot, slime, fetid waters, illness and disease’. She and her fearsome mate Typhon were the parents of other monsters: the Chimaera, the many-headed dog Orthus, Ladon, the hundred-headed dragon who guarded the apples of the Hesperides, the Colchian dragon, of the Sphinx, Cerberus, Scylla, Gorgon, the Lernaean Hydra, and the eagle which consumed the liver of Prometheus, and the Nemean lion. The linking of the monstrous Echidna to the marsupial echidna was initially puzzling. Online Etymology Dictionary explains the naming by Cuvier suggesting that it may be in connection to its long snake- like tongue. Other claims suggest that naturalists were puzzled as to whether it was mammal or amphibian. Typhoeus/Typhon above, hybrid also and consort of Echidna. He too appeared ‘man-shaped to the thighs’ then instead of legs were two coiled vipers. Instead of fingers, he had fifty serpent heads per hand. He belched red hot rocks at the sky and breathed fiery storms from his mouth. His name has been linked with typhoon a word attested since the 1550s in English for violent winds and tornadoes. Hesiod differentiates Typhaon and Typhoeus as two distinct beings. Typhaon is a son of Typhoeus (Theog. 869), and a fearful hurricane, who by Echidna became the father of the dog Orthus, Cerberus, the Lernaean hydra, Chimaera, and the Sphynx. Other writers conflate the two. Winds, fire belching and volcanoes are linked with this giant. 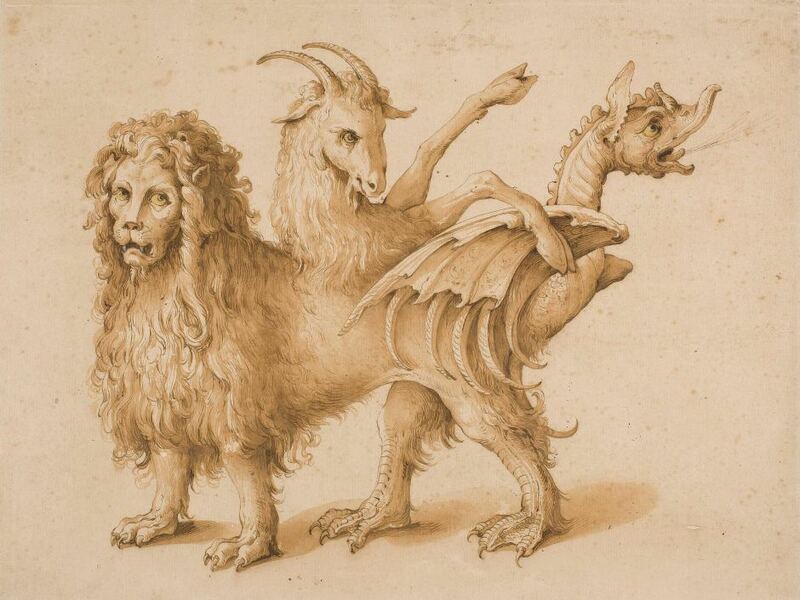 The Chimera, attributed to Jacopo Ligozzi, Italian 1547–1627. pen and brown ink and brush and brown ink over black chalk, gold paint and white body colour, 32.3 x 42.4 cm, Museo Nacional del Prado, Madrid (D01657), Spanish Royal Collection. Chimera as a word is attested in English since early 14th century. It entered the lexicon via Old French and Latin from Greek χίμαιρα:chimaira. This three headed beast Warner suggests in No Go the Bogeyman,verges on the comic. Three heads appear on her body but not in the usual above the neck position as is typical of heads. The chimera’s heads have sprouted along her body: a goats head from her dorsal ridge, and her tail spouts fire, like an amphisbaenic gargoyle doodled in the margins of a medieval manuscript: in the usual place of a head, she roars through lion’s jaws'(Warner, 242). The chimera is killed by the hero Bellerophon mounted on Pegasus which had sprung from the blood of yet another hybrid monster Medusa, too killed by another sword wielding hero Perseus. We continue to wonder about the relationship between heroes and these hybrid monsters- without the defeat of these monsters can the hero really be regarded as such? We have noticed so many are female. Nathan Bailey, early word nerd, teacher of Hebrew, Latin and Greek at a boarding school in Stepney, philologist and one of a line of lexicographers, compiled’ The Universal Etymological English Dictionary‘ and published this first in 1721. An indication of its popularity is that it reached its twentieth edition in 1763 and its 27th edition in 1794. A folio edition was published in 1730: Dictionarium Britannicum. The esteemed lexicographer Samuel Johnson also owned a copy that he annotated with his own thoughts. 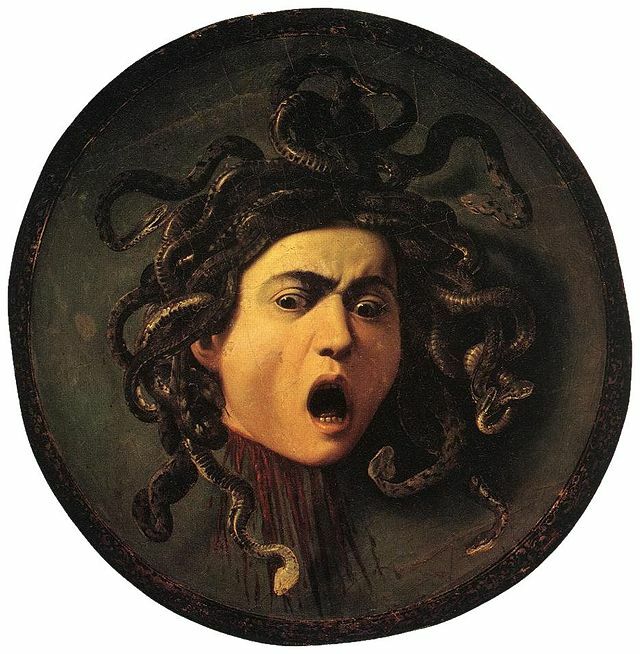 Caravaggio’s Medusa showing her at the moment of her beheading by Perseus. Her head became part of Athena’s aegis. Medousa (Medusa) one of three gorgons and the only mortal gorgon, killed by Perseus, in Greek mythology. Medusa’s head was fixed on the aegis or shield of Athene. According to the O.E.D. ‘the Greek form Μέδουσα is identical with the present participle feminine of μέδειν to protect, rule.‘ Medusa in some versions was once a beautiful woman and metamorphosed by Athena for her presumption for lying with Poseidon in her shrine. Medusa’s glance in her new form continued to captivate but ironically now petrifying the unwary gazer, turning him to stone. Medusa’s hair became venomous snakes. Punishment in becoming hybrid for hubris. The OED dates the word zombie as entering English in 1819, earlier than the Online Dictionary’s date of 1876. Both sources link to roots in West Africa. The Online Etymology Dictionary notes its original meaning as a snake god with a later shift to become the reanimated dead in voodoo. There are suggestions that this word could have originated from Louisiana creole meaning phantom or ghost. The Louisiana claim to this word links to the Spanish etymon sombra meaning shade. In the 1930’s it also developed a facetious meaning of someone who was dim- as in dead- head. So shady, ghostly,dim and snaky are these dead who walk. Marina Warner reminds us that the idea of zombie was an ‘early 19th-century import from West Africa via the Caribbean, through the diaspora brought about by the traffic in human beings’. Perhaps its this physical and spiritual sense of dislocation and alienation that is lurking behind zombie. Warner again writes:’Zombies used to be primarily victims of voodoo masters. Today, it’s become an existential term, about mental and physical enslavement, a deathly modern variation on the age-old theme of metamorphosis. ‘ Read Warner’s article The Devil Inside to explore contemporary culture and even the connection between Coleridge’s Ancient Mariner and West Indian spirit cults. 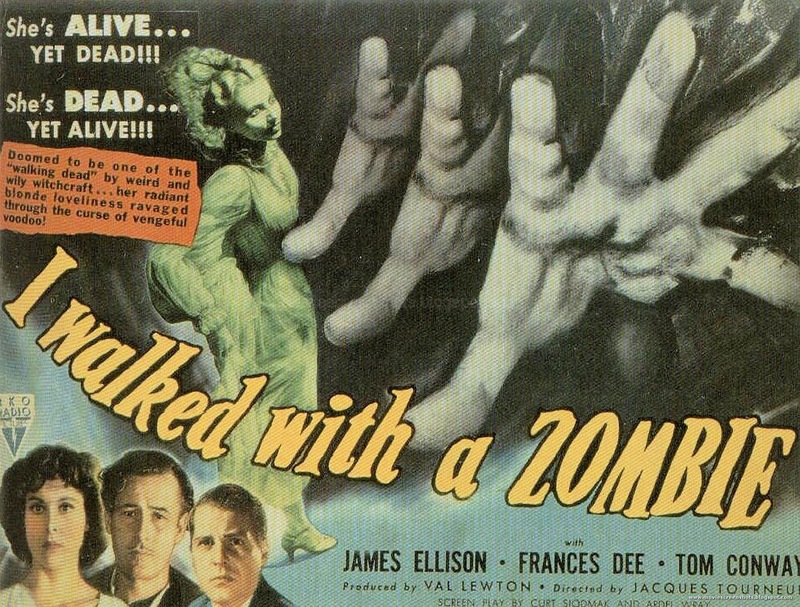 I Walked with a Zombie a 1943 horror film heavily borrowing on the narrative structure of Jane Eyre. Zombies, Echidna, Typhon, Medusa and chimera , all hybrid monsters perhaps all warnings. Wait for our for our analysis of monster next post! We continue our quest and etymological inquiry into more hybrids in Greek mythology.